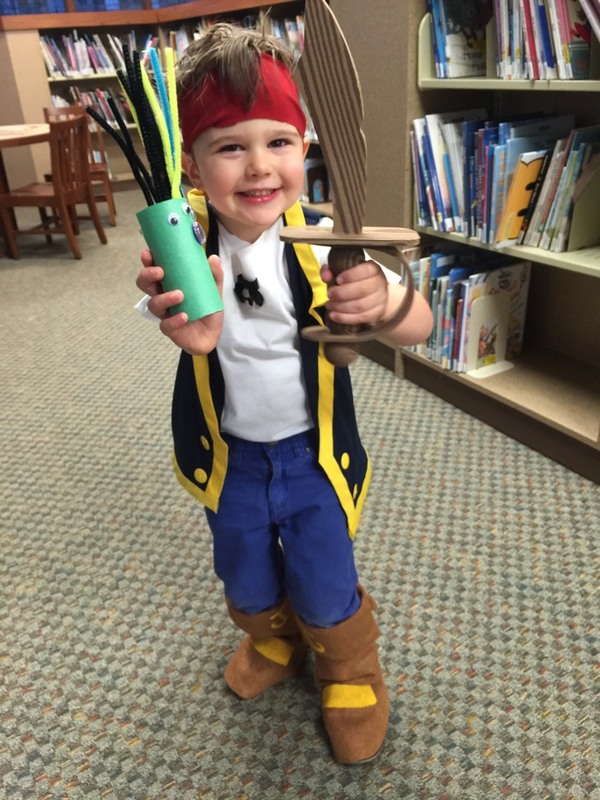 Corban’s favorite TV show is “Jake and the Neverland Pirates”—it’s a spinoff of Disney’s “Peter Pan” about a crew of nice pirates (Jake, Izzy and Cubby) who interact with Captain Hook, Smee and their gang. 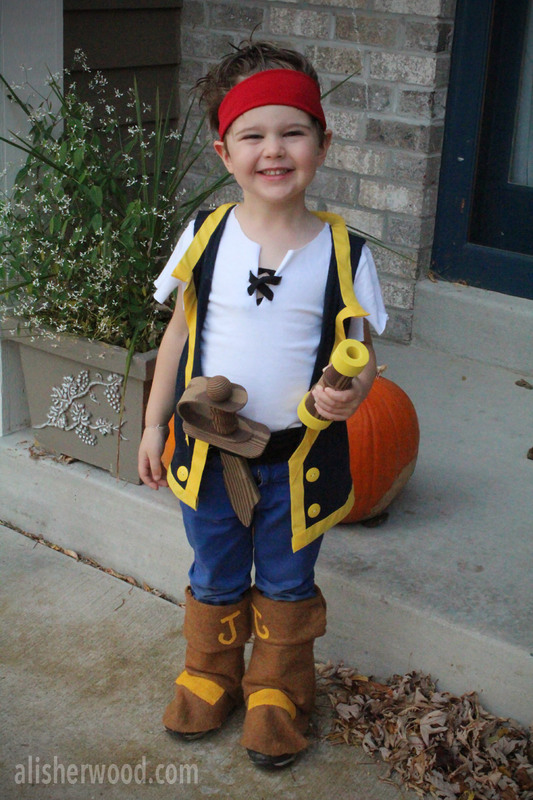 He’s been in full Jake/pirate mode since last year, so naturally he wanted to be Jake for Halloween. 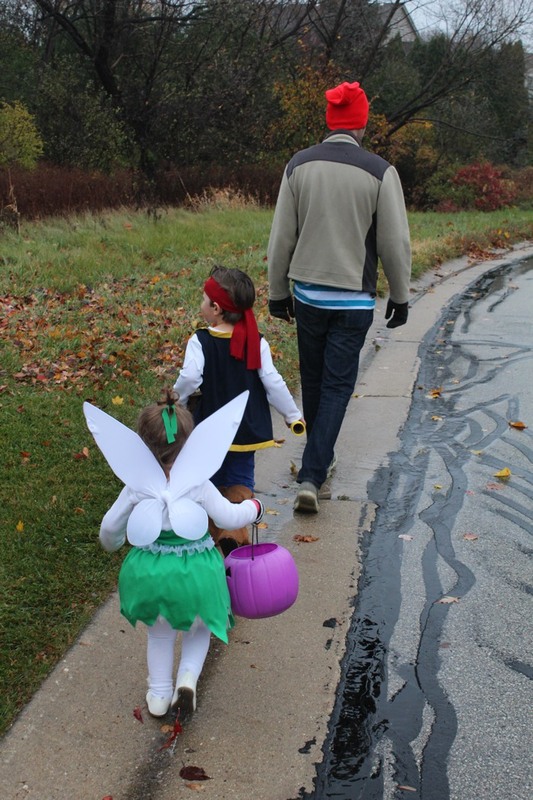 Of course this is the prime age for adorable coordinating sibling costumes, so I convinced Mara to be Tinker Bell (she makes a guest appearance on the show once in a while—it’s set in Neverland, after all). After browsing the costume selection available online, I decided it would be fun and easy to make all of our costumes. Fun, it certainly was. Easy? Well, that would be a stretch. It was definitely doable, but all the little details added up and this ended up being the most ambitious costume undertaking I’ve attempted. But I really did have a blast putting all four costumes together, and I’m pleased with how they turned out. 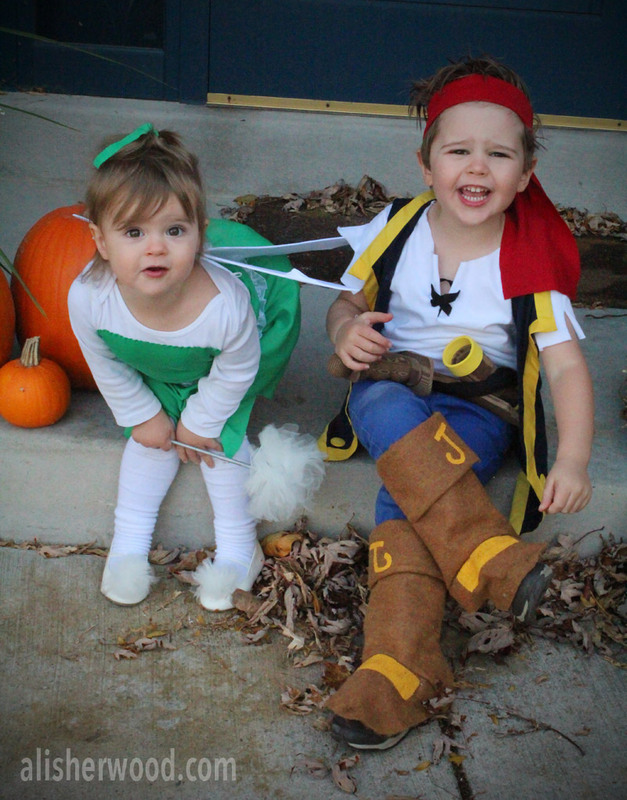 If you’re looking to make a DIY Jake, Izzy, Smee or Tinker Bell costume, read on for details on each of them. 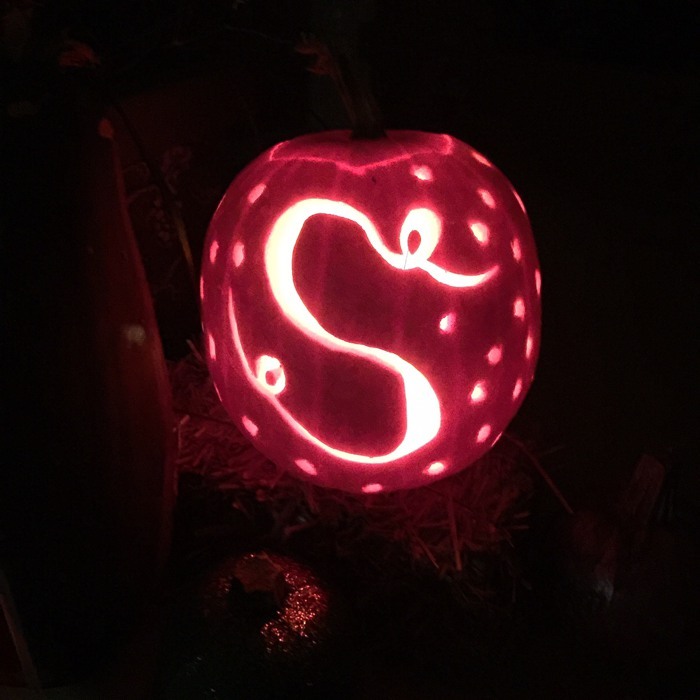 Halloween crafts at the library, and the first test run of the costume. 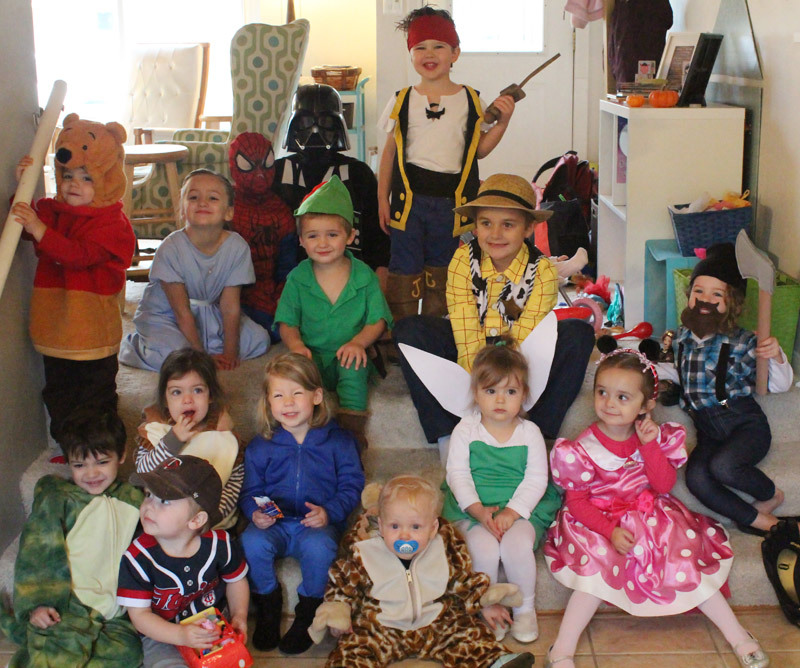 Somehow we wrangled 15 kids into a Halloween party photo. 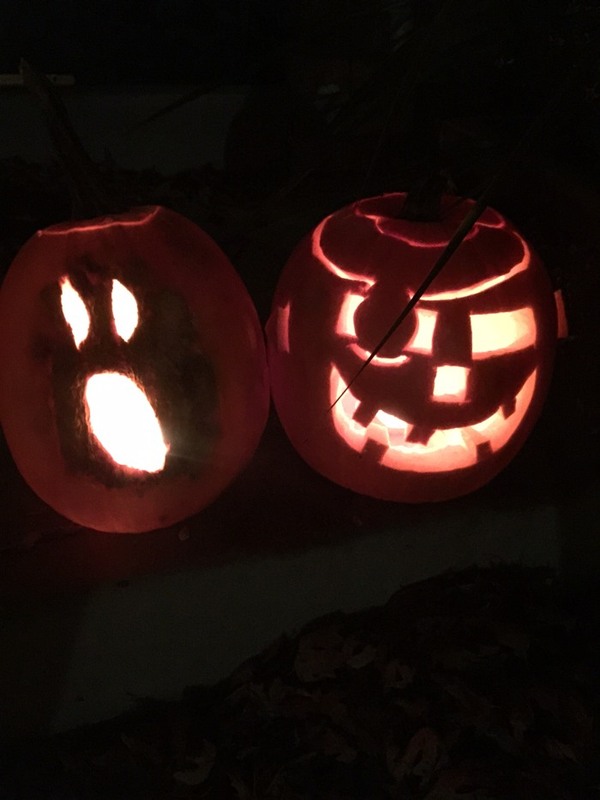 This poor pumpkin didn’t stand a chance. And got a little fancy. 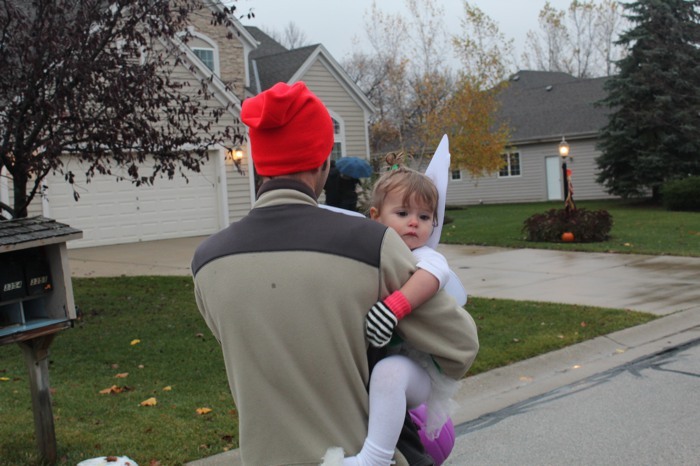 Tink didn’t end up doing much walking. Plus, it was cold and misting. Pretty good haul. 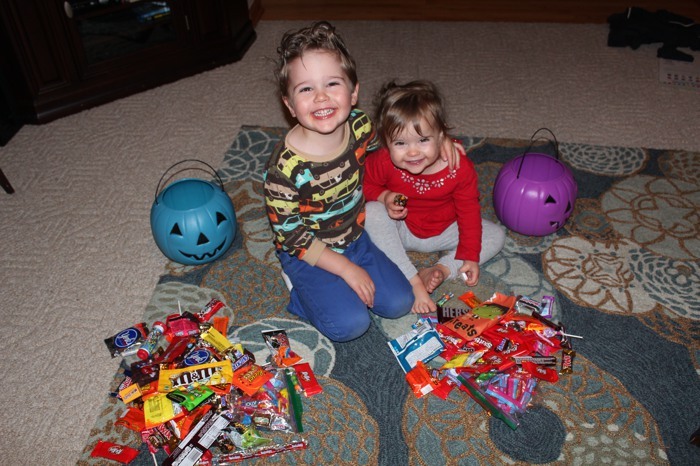 I showed them how to sort their candy. There are three basic parts to a Jake costume: The shirt, the vest and the boots. Let’s start with the easiest one. 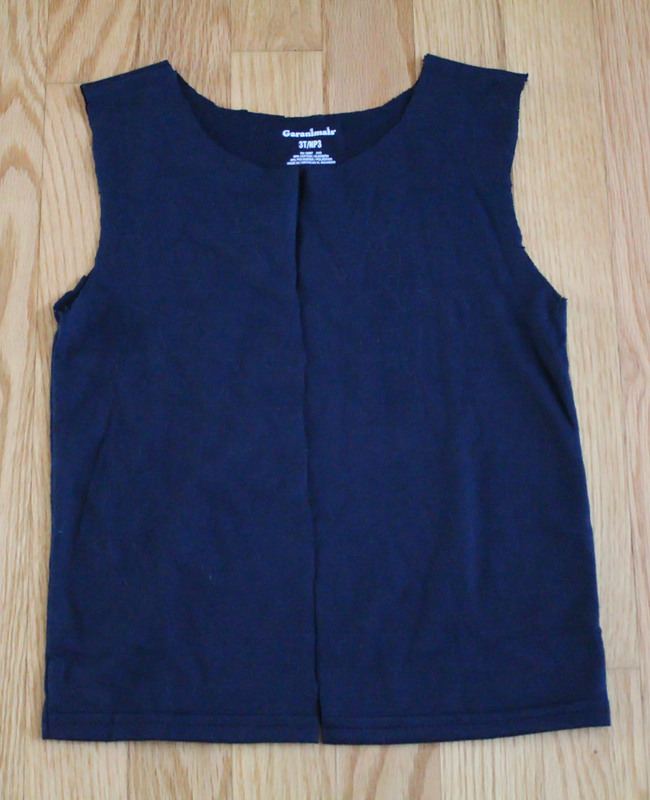 Cut the collar and sleeve hems off the T-shirt. 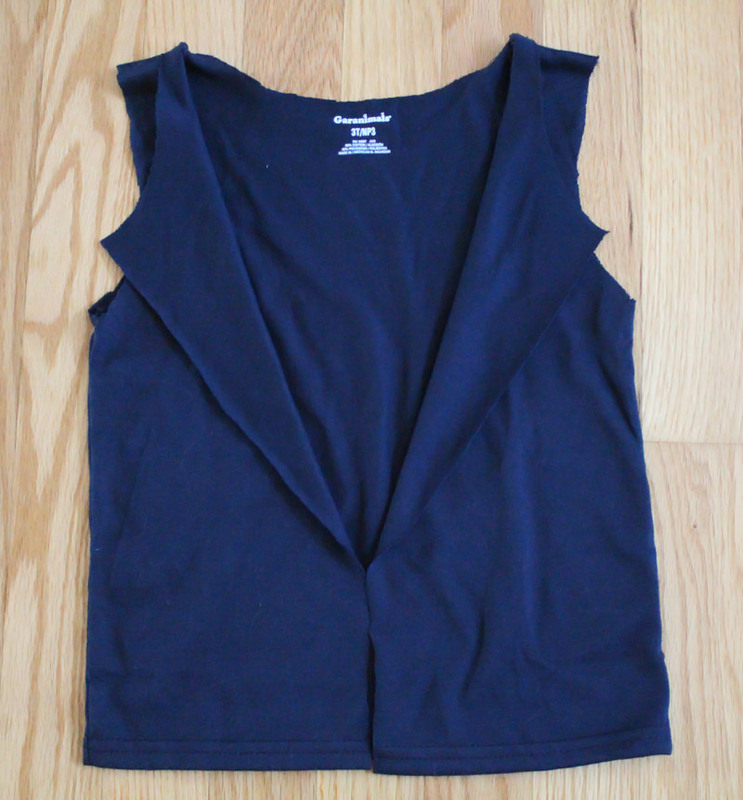 Cut a few slits in each sleeve and make a 3- or 4-inch cut down from the middle of the collar. Cut two slits on each side of that cut and slide a black ribbon through to form a loose X. 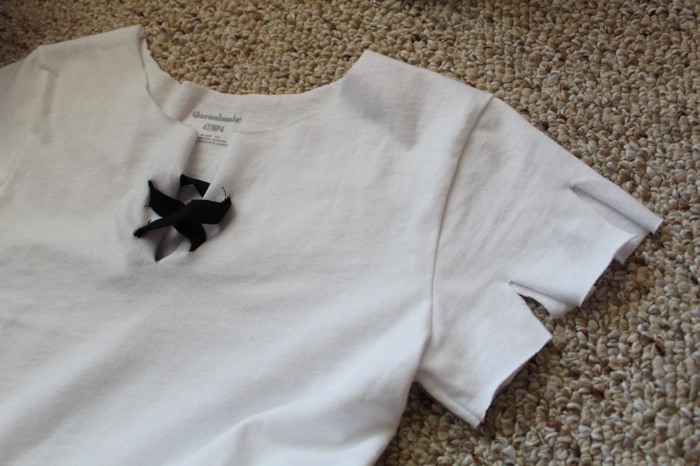 Tie the ribbon at the bottom inside the shirt. 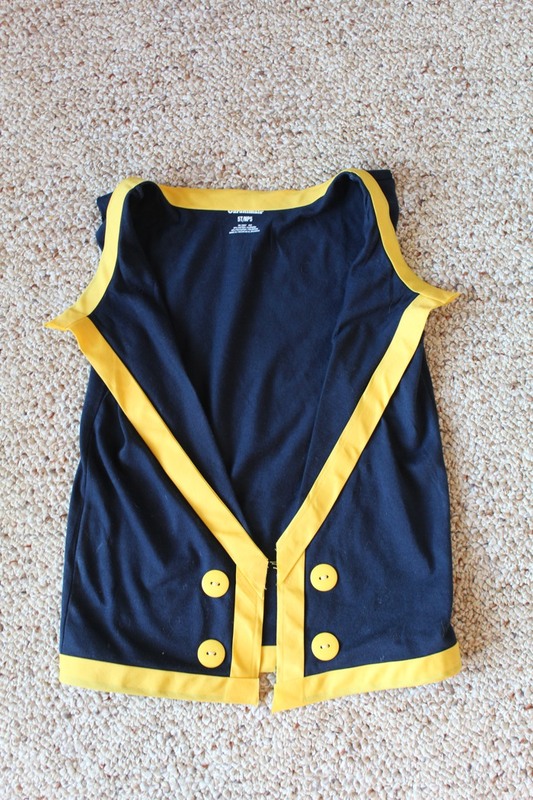 Cut off the shirt’s sleeves and collar and cut straight down the middle of the shirt to make a vest. The 3T shirt ended up being a little too small, so for the final version I used a 5T (Corban is 3, going on 4). 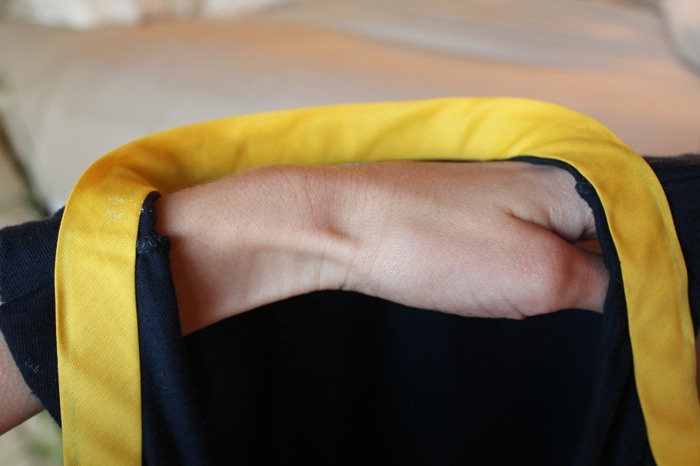 Iron the bias tape to remove any creases. Iron the vest to make a collar. Starting from the bottom of one flap of the vest, use the bonding web to attach the bias tape along the edge of the shirt. Since bias tape consists of several layers folded lengthwise, I actually attached mine around the edge—using bonding web on both the inside and outside of the vest. This looks nicer than just attaching it to the outside of the vest. Work your way along the edge of the shirt, lining the flap of the collar*, around the back of the neck**, back down the other collar and around the back of the vest, cutting the bias tape into sections as needed (I used six separate sections of tape). I followed this tutorial. The biggest challenge was to decipher the instructions since they were a bit confusing at parts. One thing I didn’t realize until my mom stepped in to help is that “right sides” in sewing lingo means the sides you want to show in the end, not the sides opposite the left. 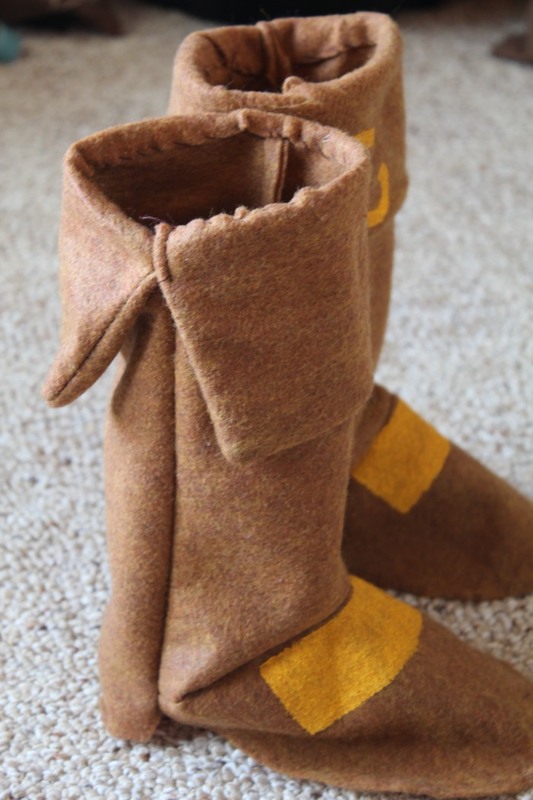 With felt, it doesn’t matter, but knowing that will help clarify the linked instructions. Another helpful hint: at the start of step 5, turn the boots rightside out. Hair—Find some mega extreme hold hair gel (that’s how the one I used marketed itself) and spike that hair straight up in front. Wooden sword—Peter insisted we buy this instead of attempt to make it. I’m glad we did even though we payed way more than we should have on Amazon for an apparently discontinued Disney Store set of Jake accessories. It’s foam and nice and Corban loves it, plus it came with a spyglass (much better than the paper towel roll I had planned) and pouch of gold dubloons. 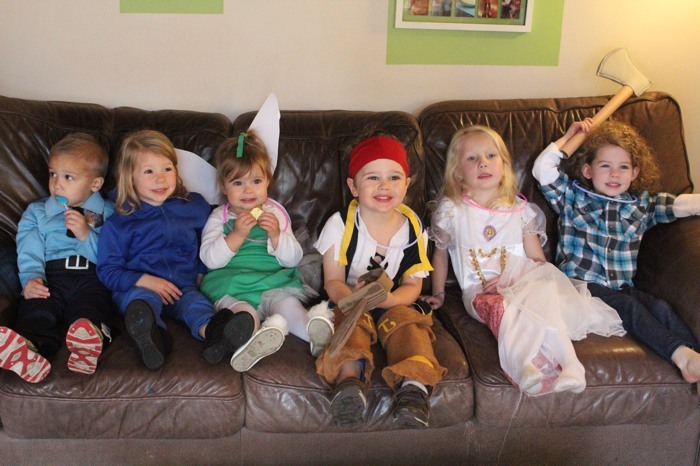 There are a lot of routes you can take with Tinker Bell. 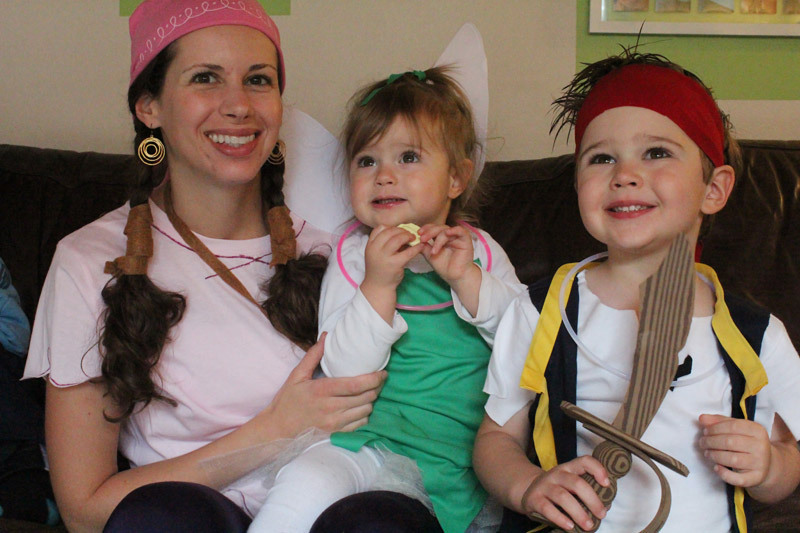 I wanted to be as authentic to the Disney version as possible while making it appropriate for a two-year-old (um, look at Tink…she is a mature, scantily clad woman). My plan was to do something like this, but use a leotard instead of sewing the body myself. I found an adorable mint green leotard, but at the last minute decided the mint green didn’t look right, so ended up hand-sewing an alternative last night. It was a smart move. 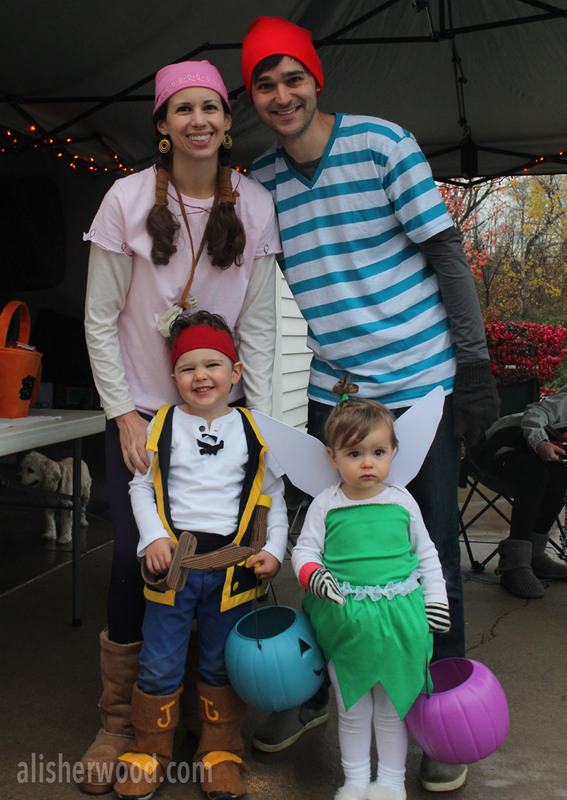 Here are the elements of our toddler Tink costume. I followed this tutorial for the skirt. 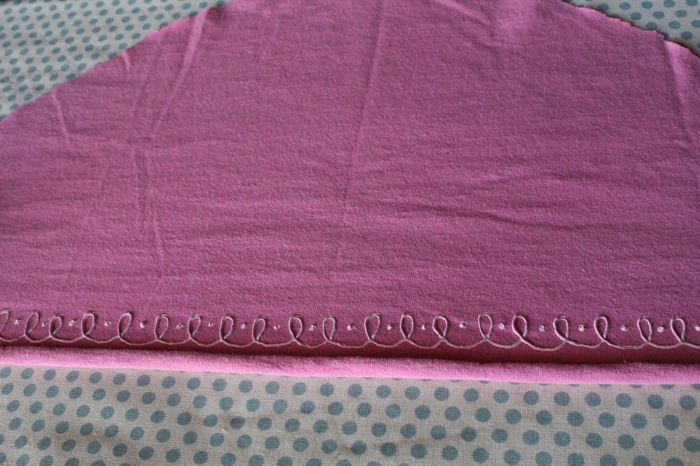 It was simple, even for a sewing novice like me. The ruffled ribbon is a good addition to cover up the seam along the waist. 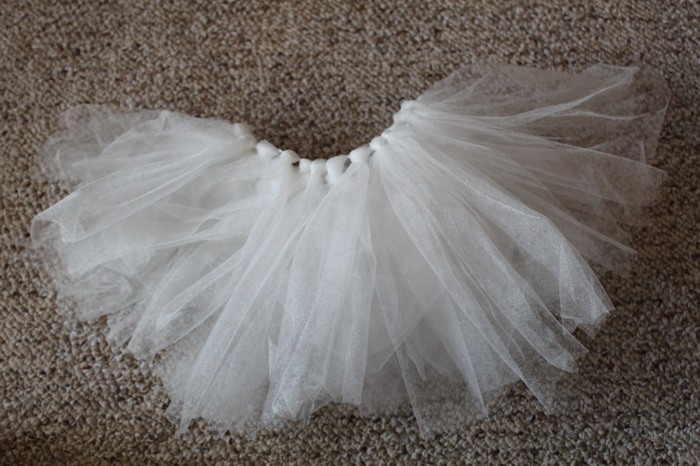 Tulle tutus are the easiest thing to make. Just loop-tie strips of tulle to a thin elastic waistband. 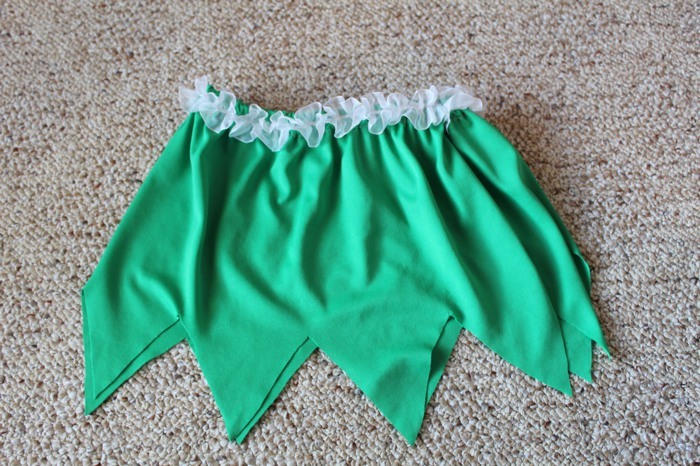 It’s a fun touch for under the Tinker Bell skirt. 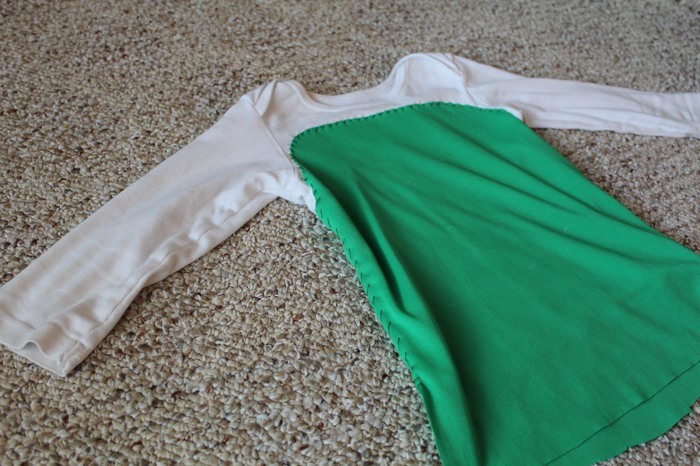 Cut and pin green fabric to the shirt, starting under the arm on one side and continuing all the way around the shirt. Hand stitch the fabric to the shirt, then stitch it down the side. You’ll tuck the shirt in, so don’t worry about the bottom. This took me a bunch of finagling and trial and error. I will try to explain what I did, though. 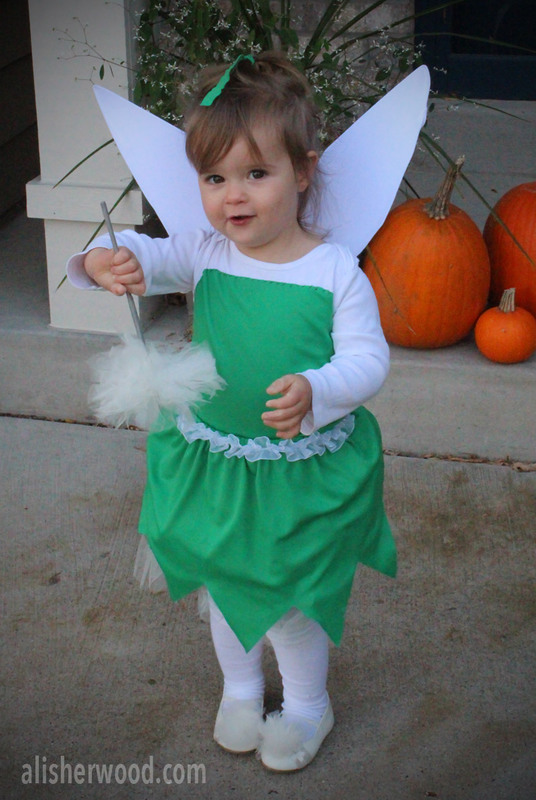 Tink’s wings each have a tall pointed section on top and a smaller, round part on bottom. For a toddler, one hanger is plenty large enough for each wing. 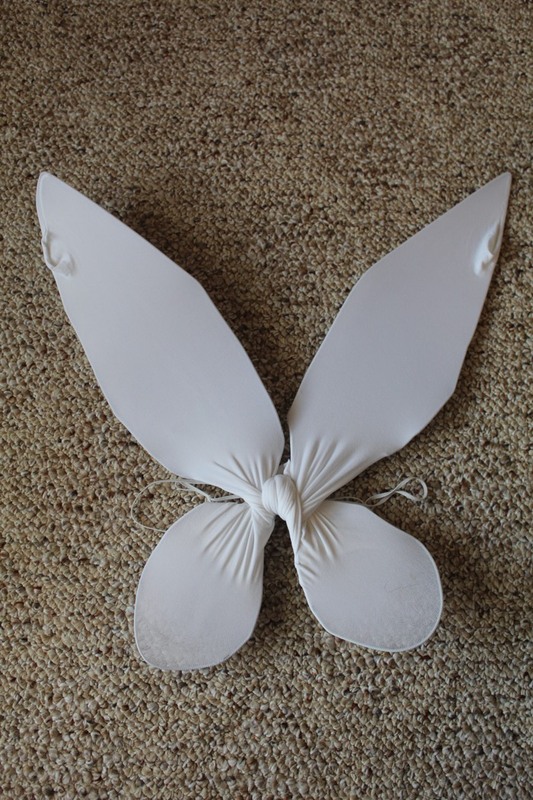 First, untwist the necks of the hangers and use pliers to form each into the shape of the wings. Leave a few inches of the end sticking out from the middle and use that part to hook the two wings together by twisting them around each other. Now, unhook the wings from one another (stay with me for a minute). Cut the legs off the tights and stretch them tightly over the wings starting over the top section of wing. I twisted them a little in between the two wing sections to help keep the shape, then pulled the open end of the tights back up to the middle after going over the bottom section. 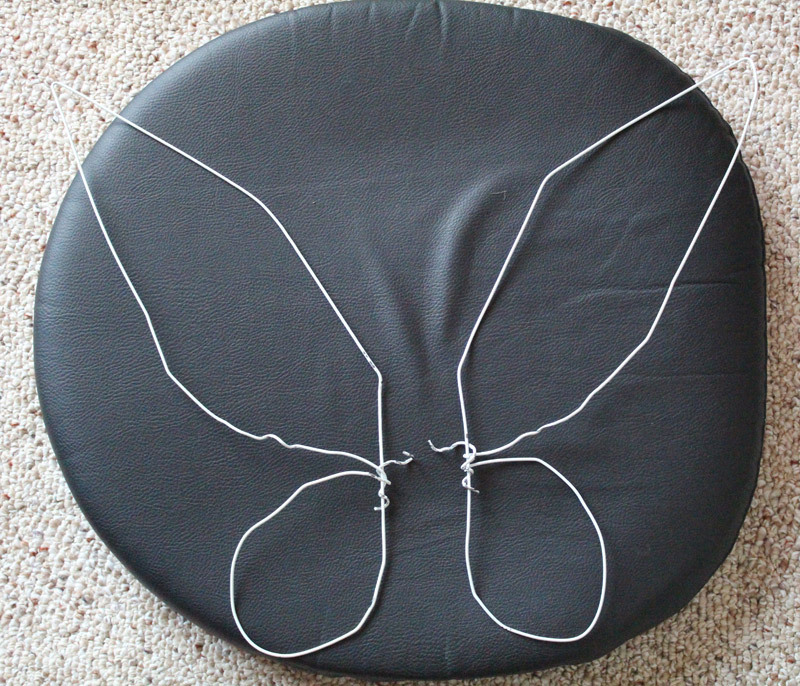 Poke the end of the wire (the part that will hook the wings together) through the tights once the tights are in place. Now, re-connect the wings. The ends of the tights will just be hanging out for now. Wrap tape around the connecting pieces of wire to keep them together (it’s OK if it’s not totally secure at this point). 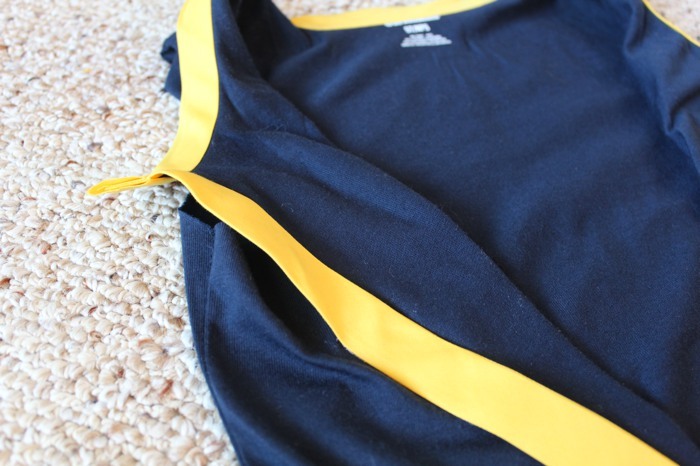 Tie the thin elastic into a loop that will fit across your little one’s back and hook around her arms. 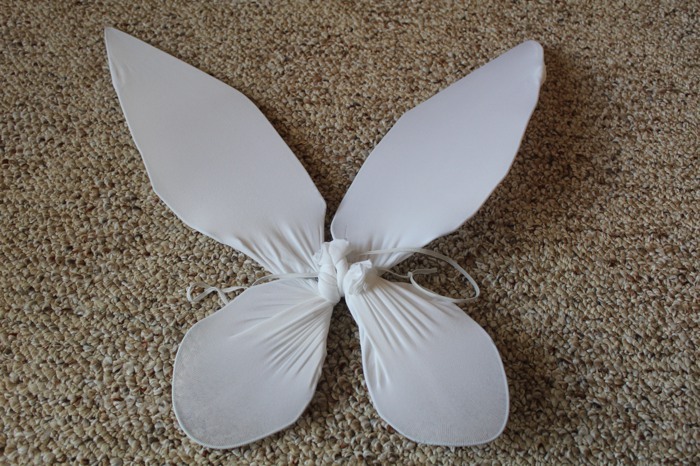 Poke the elastic into the hole of the tights on one wing and finagle it to loop around a section of wire inside, then repeat on the other wing so the wings now have elastic straps coming out from the middle. Tie the loose ends of the tights together around the connecting wire, pulling one leg around the back, then tying it together with the other leg on the side of the wings that will be facing out (the side without the elastic straps), then bringing both sides around to the side with the elastic and tying them together there (so the legs are tied together on both the front and the back of the wings). Paint glitter onto the wings if desired. Wrap washi tape around the stick in a spiral motion to cover. 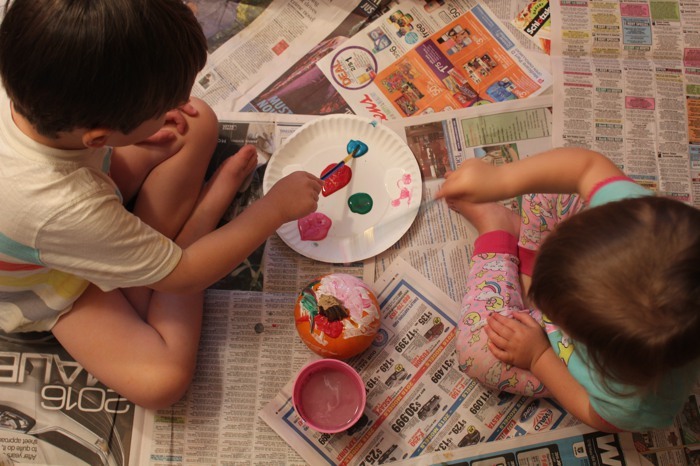 Make two tulle pom poms. To make each, cut 20-30 4-inch strips of tulle (1/2-inch-wide). Lay a wider (2- to 3-inch-wide) 4-inch strip of tulle down and stack the 20-30 strips perpendicular on top of it. Tie the thicker strip around the center of the stack of strips and knot it tightly, then knot the ends around the end of the tape-covered stick. Repeat to make the second pom pom and tie it to the same end of the stick but on the opposite side. Tape the ends of the tulle strips you used to tie the pom poms together down to the stick, using the same spiral taping motion to cover them completely. Separate the 1/2-inch strips in all directions to form a puffy ball, trimming where necessary to form a sphere around the tip of the stick. 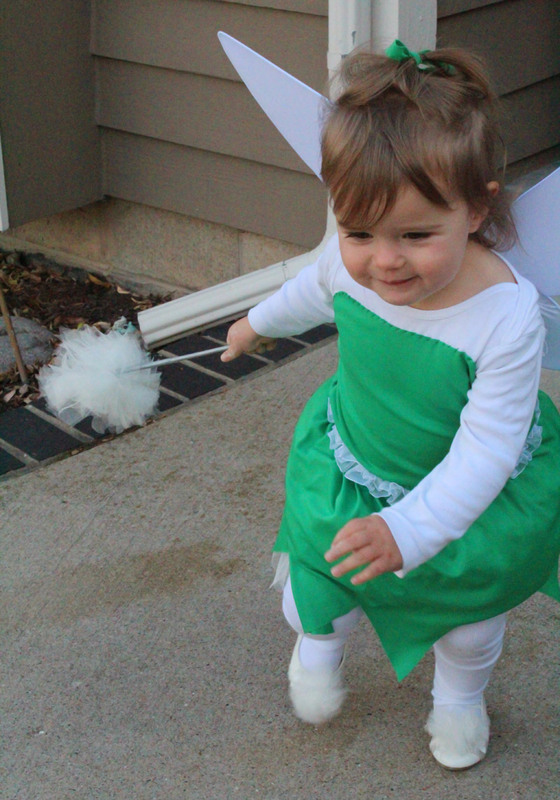 Shoes—Make tulle pom poms as described above, but tie or pin them to the toes of a pair of white or green ballet flats (technically Tink wears green shoes). Hair—She wears her hair in a high bun with a little ribbon around it and bangs sweeping down and to the side. 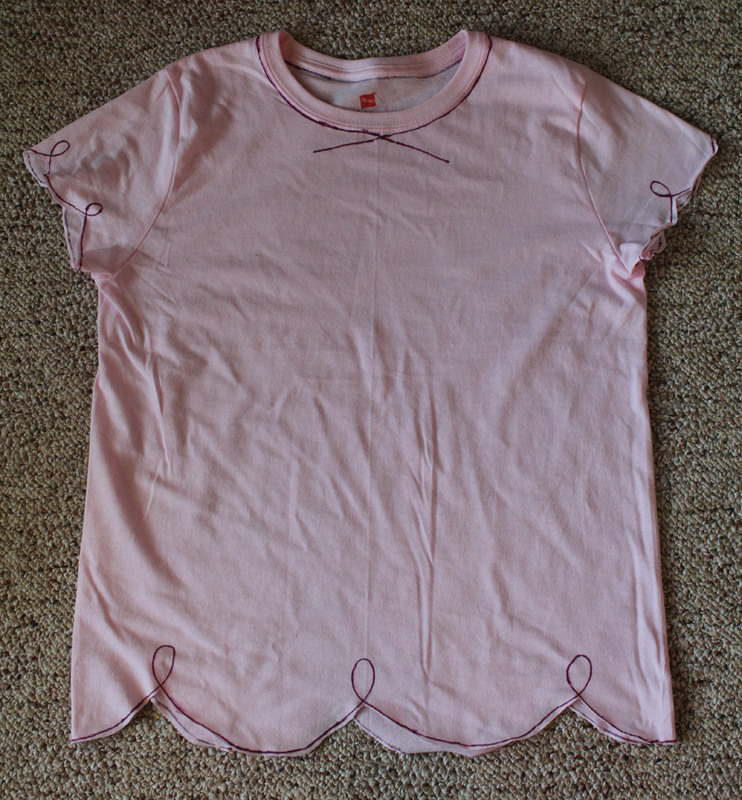 Cut the hems off the sleeves and bottom of a light pink T-shirt. Cut wide scallops around the bottom and sleeves. Outline the edges in marker, adding loops between each scallop. 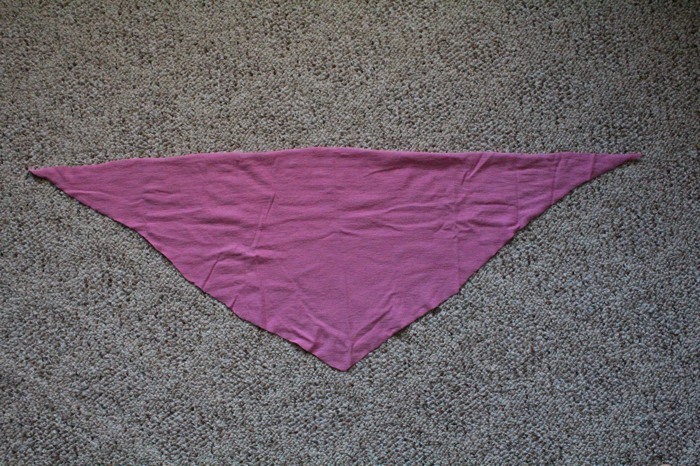 Outline the neckline, adding an upside down V shape at the neck (I messed this part up so it looks pretty bad). If using an old T-shirt, cut the hem off the bottom, then cut straight up the middle as high as you can get before hitting graphics, or up to about the sternum or mid-back. Cut all the way around the shirt from that point, so you end up with a large rectangle. Cut it into an obtuse triangle. Paint loops and dots along the edge of the triangle, as pictured. We had a pouch lying around so I just used that, but you can easily make one by cutting a circle from yellow fabric and gathering the edges together to form a pouch. Tie the felt strips or string around the top to secure it. On the show, this pouch contains pixie dust. Hair—Pigtails, or if your hair is really long like mine then add braids in to keep it under control. Wrap strips of brown felt around each pigtail. Corban called me out because Izzy has a piece of hair sticking out from the front, so if your hair is the right length to do that, you should probably do it. 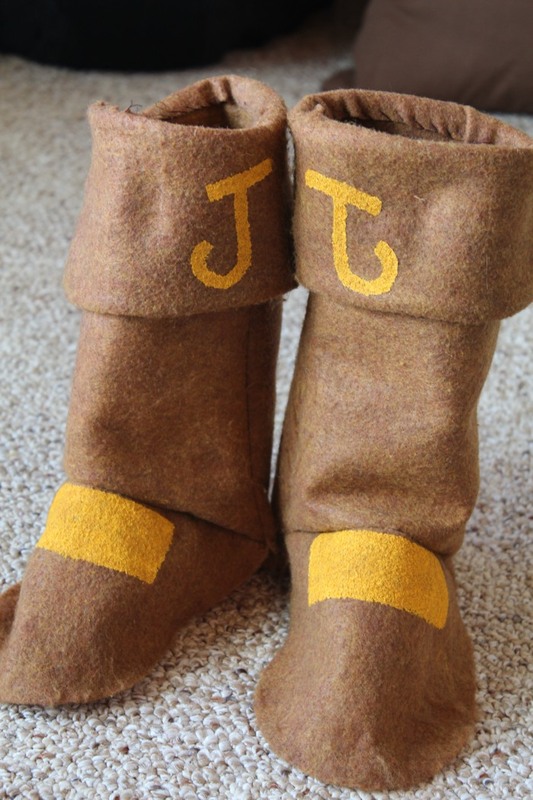 Boots—I just wore my Minnetonkas, but you could make boot covers like the Jake ones I made, just without the painted parts (note the pattern I used is for toddler size 8 to 10). Pants—Izzy wears purple pants. I found these purple fleece-lined leggings on Amazon for $5. They are super warm and comfy, though not the greatest quality (but hey, only five dollars!). Earrings—Like any good pirate, Izzy wears gold hoop earrings. This is oh so easy, hence the reason I switched from the original plan of Peter being Captain Hook. Shirt—Blue and white striped T-shirt. Shorts—Royal blue (it was cold so Peter wore jeans). Belly—Stuff a pillow in if you don’t naturally have a pot belly. Peter was going to, but ended up not bothering.